When you’re climbing a mountain, it doesn’t matter whether you identify as a man or a woman—you’re just a human being, trying to do something impossible. But when it comes to the gear, male and female climbers are miles apart. Illina Frankiv, the fourth Canadian woman to summit Mount Everest via Tibet, experienced this firsthand when she climbed the world’s tallest mountain in a summit suit—i.e. the one-piece insulated jumpsuits designed to withstand the harshest alpine conditions—made for men. Not because she wanted to, but because she had no other choice. Summit suits for women don’t exist. Frankiv discovered mountain climbing on a whim in 2015. Her friend was planning to summit Washington’s Mount Rainier, so she decided to tag along. And so Frankiv ended up scaling her first mountain—the tallest peak in the state at 14,409 ft.—without a guide. “I thought to myself, ‘It must have been just luck,’” the 28-year-old says. Turns out, it wasn’t. She went on to climb California’s Mount Shasta, Colorado’s Mount Harvard, Alaska’s Mount Denali and more—all unguided. And despite doing so successfully, she still felt the effects of wearing gear that wasn’t made for her. Despite the growing number of women getting into climbing, the industry hasn’t caught up. In the current market, there are no outdoor retailers making female summit suits—and that is not only inconvenient, but potentially dangerous, for women in pursuit of the peak. 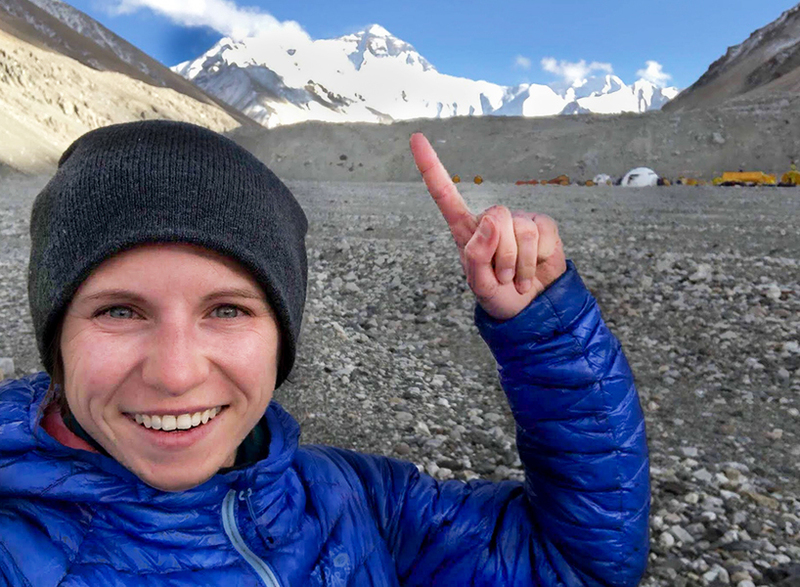 Frankiv was scaling the side of Mount Everest on a ladder at night when she came face-to-face with the realities of wearing climbing gear that was too big for her. She wore a size small men’s suit (the smallest size available), which overwhelmed her 5’7″ and 125-pound frame. “I had this bulky belly from my summit suit that I had to push back to see where my toes were going,” Frankiv recounts. Being able to see each careful step was imperative because, as Frankiv explains, missing a rung in that scenario could’ve lead to serious injury or even death. For the average person, a little extra bulk in their winter gear is no big deal, but when you’re climbing up a mountain—in this case, the highest mountain in the world—it can make all of the difference. With an increasing amount of female mountaineers and campaigns like The North Face’s Move Mountains, there’s still very little room for women in the outdoor climbing apparel market. For example in 2013, Berghaus, a UK outdoor clothing and equipment company, made a summit suit for men—the limited-edition Men’s Ulvetana Down Suit (which is now sold out)—but not for women. Yet, half of the product team at Berghaus, including the head of product, Karen Williams, are women, according to the brand. American retailers The North Face and Mountain Hardwear only carry summit suits for men (the Men’s Himalayan Suit and Men’s Absolute Zero Suit, respectively). FLARE reached out to both brands asking for a comment, but they didn’t respond as of press time. The lack of mountain climbing gear for women isn’t stopping Frankiv—instead, it’s making her push harder. One of Frankiv’s goals is to climb the highest mountain in each of the seven continents, known as completing the Seven Summits. It’s a feat that only 416 people in the world have accomplished successfully, only 17% of which were women. She plans to climb Tibet’s Mount Shishapangma, a climb of 26,289 ft., in the Himalayas next year. If she succeeds, Frankiv will become the first Canadian woman ever to make it to the top of that mountain. As she gears up for her next adventure, Frankiv says she will make sure to get attire that is as light and fitted as possible (like, lighter hiking boots and a more form-fitting sleeping bag to help her retain heat while she sleeps)—until summit suits are made for women—to lessen the risk for her next climb. But even so, she’s aware of the risk of not having suits made for her.